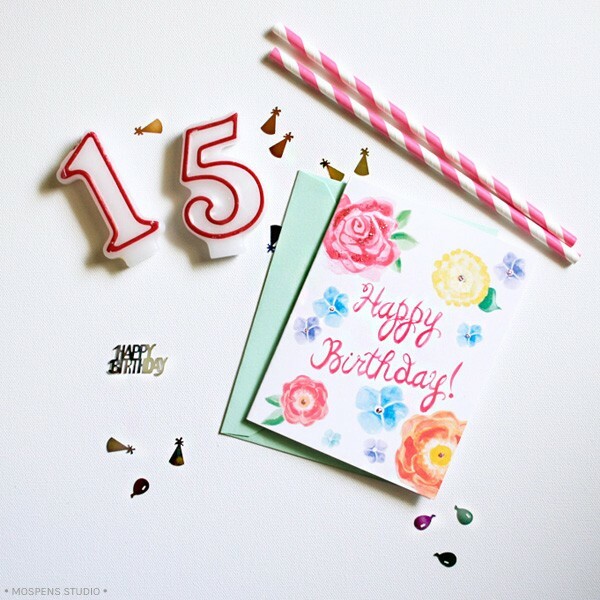 Today we are celebrating 15 years of handcrafting artwork and custom stationery cards for clients all over the world! 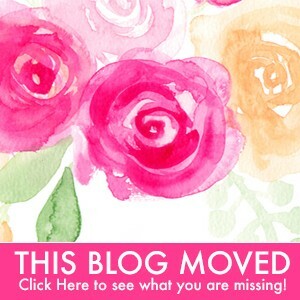 If you would have told me that the small design studio I started out of our sunroom in our home would have flourished into a 15 year old business, I would have never believed you. The “custom invitation studio” path was not yet paved. No one I knew personally was even selling anything on the internet. I was sailing into uncharted waters by myself with a pencil, paint brush, 5,895 ideas, and new mac on hand. After being discovered by an editor from a large wedding magazine and my invitations being published, business took off! That is when my husband (GRATEFULLY) joined the team full time. A-list celebrities (we had seen in popular movies and still do today), their friends, large corporations, and fabulous creative clients began what was an amazing journey in the stationery design world for us. Orders were streaming in from countries I have never even heard of… and they still do today. 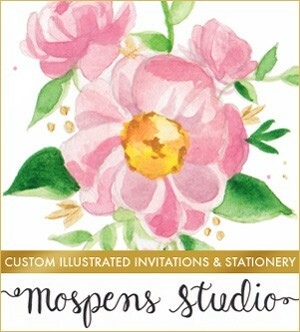 In honor of turning 15 we wanted a more grown up name and decided to change My Personal Artist to Mospens Studio recently. Our new name will reflect our new stationery products, greeting cards, art prints, and letterpress stationery lines we are developing daily. We are truly excited to grow and look forward to 15 more years! We are BEYOND grateful for our clients today and repeat clients who we completely ADORE! Without YOU, we would not be a float. We THANK YOU. Kindly. For all of your support and love for our very small independent design studio. In celebration, we would like you to enjoy 15% off orders of $150.00 today. I just finished up this purple watercolor pansy flower for custom wedding invitations. Perfect for an outdoor wedding surrounded by a summer garden. Purple and lavender colors with a tiny splash of yellow. A super sweet and whimsical flower. Now available for your bridal shower invitations, thank yous, personal stationery, and pretty paper goods. 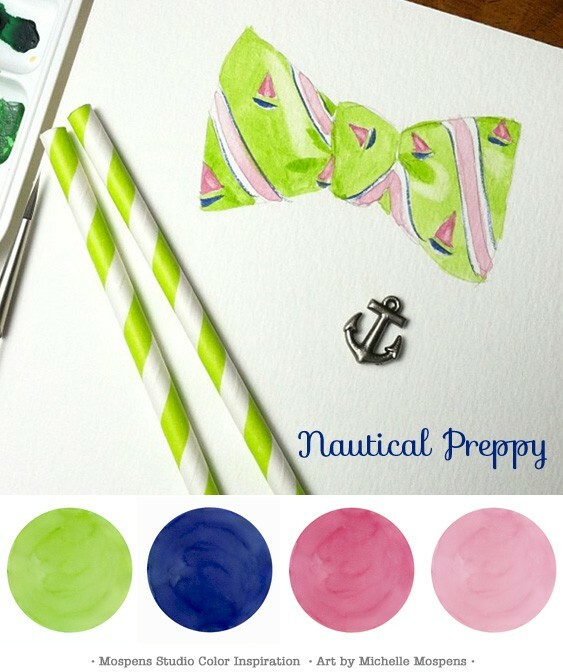 Light lime green, pink, and light pink with a rich splash of nautical navy. Perfect for a preppy spring or summer event. If you love to sail or be beside the seaside, this color palette is for you! For an elegant nautical wedding look keep the navy as your main color and add a splish of pink and splash of light green as accent colors. Just fabulous! Have a sparkling day and ENJOY! Aloha! I just ADORE this tropical hibiscus flower I spotted at our local green house. Thankfully I was ready with my Canon camera to capture this beauty. Bright yellow, light tangerine orange, bright orange, saturated bright tropical red hibiscus with a base of green leaves. Simply beautiful. The Sarah Design hibiscus wedding invitation is a perfect match! I’ve been a HUGE fan of illustrating and painting hibiscus flowers since I started offering my invitations and cards online. 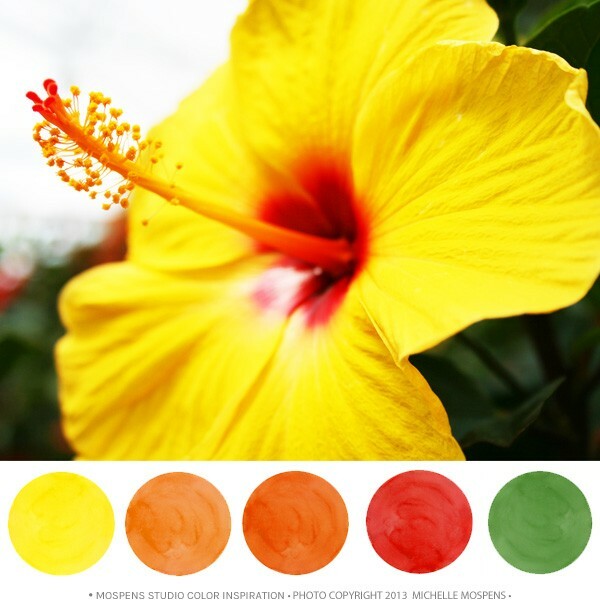 The hibiscus flower fits perfectly with a beach wedding, tropical event, and Hawaiian wedding. If you are going to use the yellow and red, be sure to not over do it. Remember, yellow + red = mustard and ketchup. You don’t want equal parts of each color. Just a splash of one then use the other as your main wedding color. You can pair these vibrant hues with mocha, taupe, gray, black, silver, or gold. 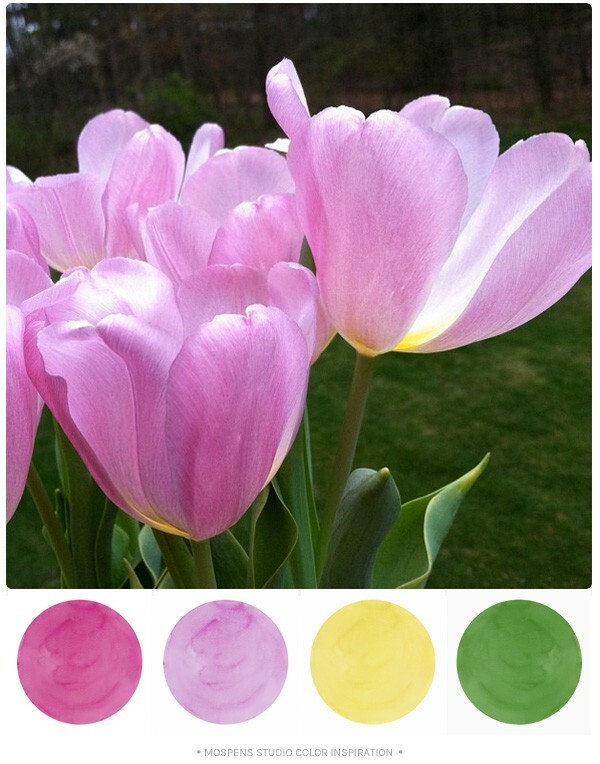 Pretty pastels with a splash of gold makes up today’s color inspiration! 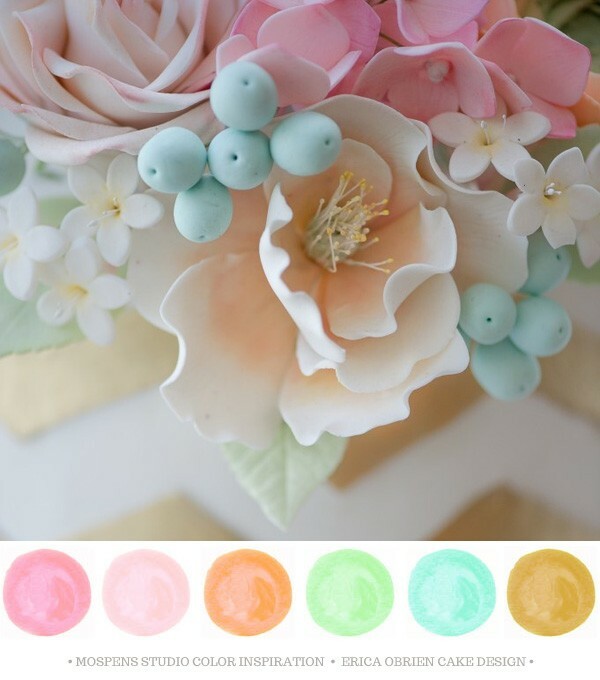 Light rose pink, peach, mint green, light aqua, and gold colors are perfect for a spring or summer wedding. In the past few months I have seen a HUGE pretty pink trend. Super soft blush pinks paired with gold, silver, black, and/or grays. I am truly smitten over Erica Obrien’s cake design. See the entire wedding cake in my earlier wedding cake post. It is just fabulous.